You want every minute detail chalked out? We’ve got the local connections to make it happen. 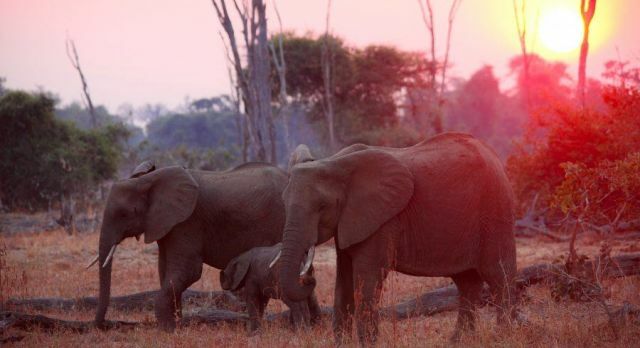 Wildlife is at your fingertips when you travel through Zambia. A pride of lionesses stalks a herd of zebra as you look on from your safari vehicle. Graceful puku and reedbuck prance through the savannah of South Luangwa National Park. A strong population of leopards occupies this safe and breathtaking African wilderness, making them easily spotted, lounging on trees or walking along grassy paths. It’s a sight to behold along the Luangwa River, when thousands of colorful southern-carmine bee-eaters swarm the area during breeding season in August-September. Birders delight in spotting rare shoebill stork in the marshy wetlands of Bangweulu. In the wildlife corridor that runs through the north-central part of Zambia, close to a hundred different mammal species can be spotted. 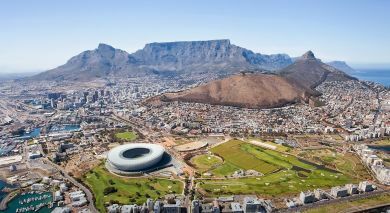 Enchanting Travels has the expertise and local connections required to build you a fantastic bespoke tour, one that explores this amazing spectacle of African wilderness. Zambia is also considered Africa’s adventure capital. There are walking safaris through the vast floodplain, and night drives through the bush to spot nocturnal creatures on the prowl. 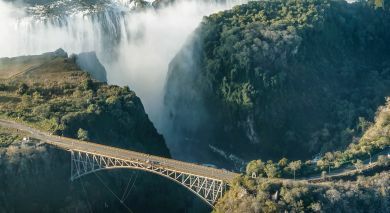 Raise the adrenaline bar and go white-water rafting on the Zambezi, bungee jump near Victoria Falls, fly a microlight over Victoria Falls, or speedboat ride through the Kafue River. The charming city of Livingstone too deserves some time. 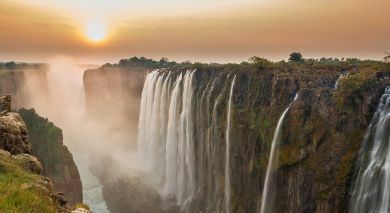 From there visit the fabulous Victoria Falls, and its Boiling Pot and Devil’s Pool. Wind up your holiday with a luxurious stay on a private island on the Zambezi River. In this tranquil paradise you can reflect and recharge, and perhaps start plotting your next vacation. The climate in Zambia is a so-called tropical climate. The temperatures are very pleasant due to the high altitude. For an overview on the best time to visit Zambia, follow this link. From the stunning Victoria Falls to scintillating wildlife safaris and incredible river cruises – Zambia is waiting to be discovered! Follow to this link for an overview on the top ten attractions, activities and highlights in Zambia. The Zambian culture has its roots in native traditions but it is usually only in the rural regions that they are strictly followed, such as lobola, a dowry that is given to the parents of a new bride. Most Zambian people follow Christianity although there are a few Muslims and Hindus and followers of traditional tribal belief systems. When a member of a community dies, morning is done loudly and emotionally during the burial. Music and dance are an integral part of the culture of Zambia. When you enjoy one of our Zambia tours you will find that there are many initiation ceremonies in the society that involve drumming and dance. A thumb piano known as the mbira is an integral part of local music. It was near extinction in the 1930s, but made a comeback in the 1960s and is now popular in the world music scene. Kwela, a penny-whistle based street music, Afro-jazz, gospel, and jit (electric-guitar focused pop music), rumba and Bulawayo (Zimbabwean hip hop)are also all popular musical styles, which you can experience on your Zambia tours. If someone approaches you, it is expected that you will give the first greeting, which is important for establishing a conversation. Handshakes are popular but men should not offer their hand upon greeting a woman unless she offers it first. Gift giving is considered a sign of friendship and honor, therefore it is considered insulting to refuse a gift. Always accept gifts with both hands as you thank the person. 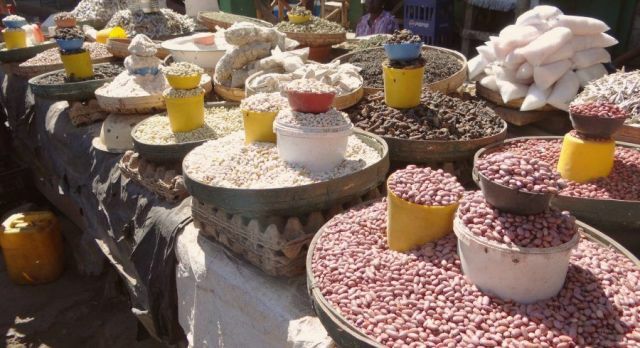 Food in Zambia is not dissimilar from most of the African continent, with its focus on cereals staples such as maize (cornmeal), millet and sorghum. Nshima (ground maize) is the most popular meal. 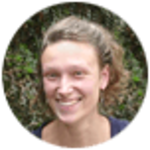 Zambian cuisine has been influenced by the British as they imported new breeds of cattle and sheep into the country and even planted high-quality coffee. Asian spices are also used in the preparation, such as pepper, cloves, curry, nutmeg and cinnamon, as well as turmeric, known locally as village curry. Root vegetables such as yams and sweet potatoes and cocoa and peanuts are also grown in the country, and have influenced Zambian dishes. Unlike the north of the country where the Bemba people eat a largely vegetarian diet, in the eastern areas you will find a focus on game-rich meals during one of our Zambia tours. The Tumbuka people have their own way to prepare meat, usually sun drying, then boiling to soften it, before frying to a golden color. For the more adventurous, mice and caterpillars are also considered local delicacies! 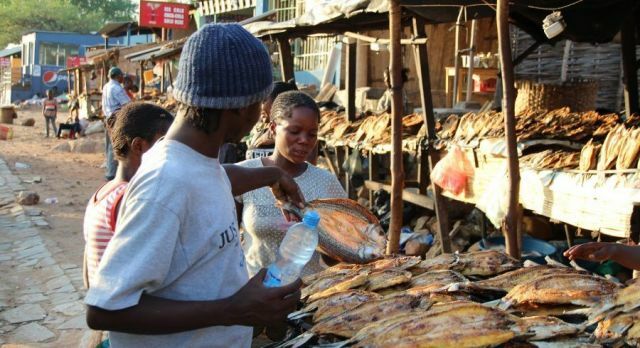 Why not try one of these delicious Zambian dishes? Mealie bread with blackened chilies: cornbread complete with fresh corn kernels, giving a sweetness to it. Polenta pie: a delicious and crusty alternative to pot pie! Village chicken: free-range chickens that roam freely and are quite a tough meat so are boiled for several hours. Samp: a traditional Bemba recipe with just two ingredients, dried beans and hominy (dried puffed and chewy corn kernels). Kibbutz salad: a Bemba dish of cucumber, lemon, tomatoes, red bell peppers, garlic, sugar, and parsley. Corned beef cakes: cooked with yams or sweet potatoes and cayenne pepper, these cakes have a lovely sweetness and a spicy kick! Munkoyo: Zambia tours are incomplete without trying the local favorite non-alcohol drink made from maize meal and the shredded and dried roots of the Munkoyo tree. 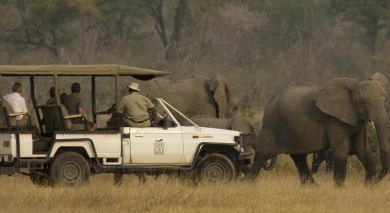 The Enchanting Travels team look forward to helping plan unique and custom Zambia tour. Zambia tours are a great way to learn about the country’s early human history, which is thought to begin in the Stone Age with the nomadic hunter-gatherer Bushmen. Around the 11th century, the agricultural culture of the Luangwa grew near the confluence of the country’s two main rivers, the Zambezi and the Kafue. Over the next few centuries, kingdoms developed and in the 16th century, the Portuguese landed and traded goods to local rulers in return for slaves. By the early 1800s the Zulu ruler Shaka conquered much of southern and central Africa, and there was much human migration in Zambia at this time. In 1851 the missionary explorer David Livingstone arrived and saw the stunning Victoria Falls, renaming them after his Queen. Livingstone tried to form a mission in the Kololo kingdom and end the slave trade but failed so the country was once again left alone for a few more decades. Today, a Victoria Falls tour is a main attraction of the country. In 1889, the British took charge in order to mine the rich minerals in the land. This was agreed by a local king in return for an annual fee and protection of the Ndebele people. When other native tribes refused to work with the British colonists, troops would be brought in. In the 1920s cobalt and copper were discovered, which led to the country becoming a major mining and export country and Zambia became a British protectorate. North Rhodesia, as it was known, was given its new name of Zambia when it gained independence in 1964. In the 1970s Zambia was part of the Rhodesian Bush War, a civil war over the unrecognized territory of Rhodesia. Today the country is peaceful and economically progressive, and Zambia tours have flourished.